Here’s a basic routine of stretches for your neck. Remember to take your time and don’t push through a painful restriction. If any of them produce dizziness or make you feel sick then stop and call us on 01600 772166. Research has shown that this exercise recruits the supraspinatus and infraspinatus muscles very highly – two important rotator cuff muscles. 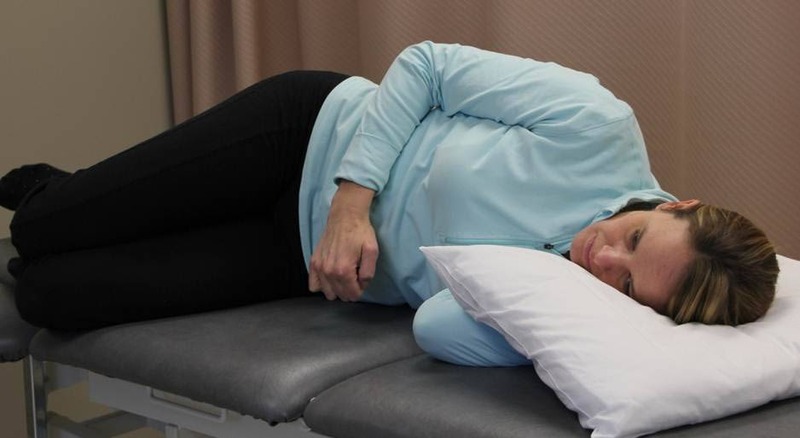 To perform it, lie on your side with your affected shoulder upper most making sure your hips are above one another. Hold a light weight in one hand by your hip, raise your arm up above your hip. Stop when your arm makes a 45 degree angle. Perform sets of 10 repetitions, 2-3 x per week. A 2 kg weight is sufficient for a female to begin with and 3kg for a male. Progress to 5 and 7kg respectively. 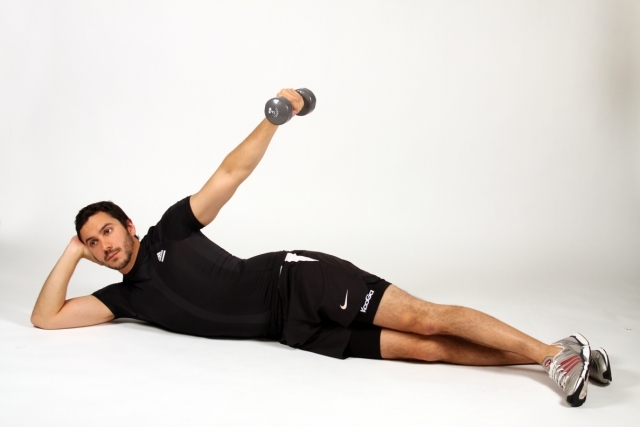 The second exercise works on the rotation range and strength of your shoulder. Start in the position shown. Keeping your elbow tight against your side, move your forearm and hand towards the ceiling. Move the arm as far as feels comfortable and try not to hunch your shoulders towards your ears during the manoevre. The movements should be performed slowly and smoothly to achieve maximum control. Again 10 repetitions, 2-3 x per weeks. A light 1-2kg weight can be used as your condition allows. We’re very happy to review these exercises as you progress. If anything feels wrong whilst performing either of them, stop and call us on 01600 772166. Again, try 15-20 secs per side. Don’t forget the nicely tightened abdomen. Don’t forget to breath ! Repeat for the other side. Once again, a tightened abdominal corset is important here also. Hold this position for 10-15 seconds if you can. A progression from this is to lift one leg. Be careful it’s certainly harder than it looks ! Repeat using the other leg. Try this one but don’t be in a hurry to move your arm or leg too far away from your trunk. Also, make sure your tummy muscles are tight before moving your arm or leg. You should feel that your trunk doesn’t wobble when you reach away. It will take you a few weeks before you can do both arm AND leg. Good luck with these exercises. Building core strength takes time and enthusiasm. THESE EXERCISES REALLY DO HELP. Call the practice on 01600 772166 if you encounter any issues either during or after performing any of these core stability exercises. Here are a couple of nice routines for exercising your back. Back Routine (2) – this one demonstrates a stretch called the “tail wag” which we often recommend. It is important to perform regular exercises for sciatic nerve pain when experiencing sciatica. These exercises are called nerve or neural flossing. Nerve flossing helps to get the nerve moving within the body and decreases pain and inflammation. All of our nerves travel through our body in small tunnels. Your nerves are attached at the origin of the nerve at the spinal column, and at the end of the nerve (usually the hand or foot). As they travel through these tunnels they can get pinched or stuck from tight muscles, scar tissue or adhesions. When they get stuck they create nerve tension that can manifest itself as pain or tightness, just like with sciatica. Nerve flossing helps to pull the nerve through these tunnels and helping free them up from entrapment and adhesions. Research has shown that the nerve can travel a couple of centimeters within it’s tunnel when nerve flossing is performed. The idea is to pull from one end of the nerve while relaxing the other end of the nerve (like a puppet). Nerve flossing exercises for sciatic nerve pain are performed by pretending there is a string from your toe to your forehead. In a sitting position, bend your knee backwards under the chair. This pulls the imaginary string from your forehead causing your head to lower at the same time. Now raise your head to look at the ceiling, at the same time as you straighten your leg (the toe gets pulled by the imaginary string). This exercise should be performed multiple times daily when experiencing sciatica, and can be used as a vital part of the home treatment for sciatica pain. It is important to stop performing nerve flossing if you experience increased pain during the exercise. This exercise can be performed sitting or lying on your back. Please tell us how useful you find this exercise, feedback is always welcomed and valued. Here’s a link to a helpful hamstring stretch. Please take care, take your time and stay within and on the edge of what feels comfortable. More pain DOES NOT mean more gain. We think that this is an informative page and will help to rehabilitate a stiff / shortened calf. It is important to not over stretch if there is any chance that you calf or achilles tendon is torn. If in doubt, ask one of us to examine you.